Indian restaurant chicken jalfrezi. Big, big flavours. It’s near the top of the list of favourite curries in the UK. It’s a bit different too. Kind of a Chinese thing going on with the large chunks of stir-fried onion and green pepper. Has a bit of a smoky taste. It’s medium hot unless you eat one of the signature big pieces of chili. Then it’s a hot curry. Definitely hot. But really, really tasty. You can even make a vegan version with paneer instead of chicken. The key to the smoky taste is to get some blistering of the green pepper skin when doing the initial stir fry. Onions and green pepper go in to hot oil and cook until the edges of the onion turn brown and you start to get a bit of roasted pepper action. This gives it the smoky flavour. And you want the smoky flavour. That’s what this curry Indian restaurant chicken jalfrezi is all about. I used to wonder what made a great chicken jalfrezi. Now I know. And so do you. This chicken jalfrezi is prepared as they do in Indian restaurants. It’s heavy on the prep and lightning fast to make. You can make it with chicken or lamb. I’ve even seen paneer versions for a vegan alternative. Do your prep before you get started. Make your curry base and have some heated and ready to go. Pre-cook your meat. Measure out your ingredients. Have everything ready. Once you get going it’s about 10 minutes from start to finish. Put on an apron – a bit of splatter is part of the fun. Then get ready to make an awesome chicken jalfrezi. If you read the guide to Indian restaurant technique yet, do it now. It has pictures to help you understand the recipe. There’s also a guide to Indian ingredients in that post. There’s even a video. 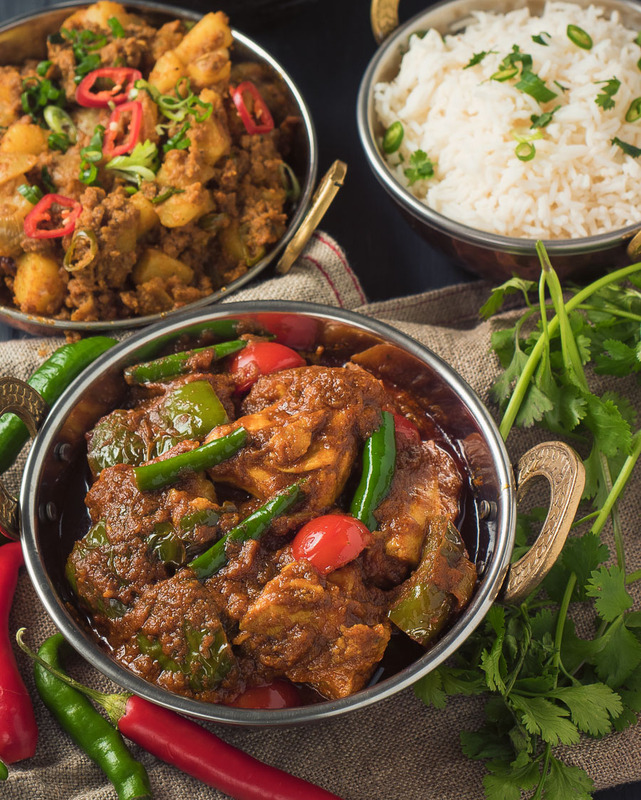 Indian restaurant chicken jalfrezi is all about big, bold, smoky flavours. Make sure you really blister your peppers to get the full experience. Heat your frying pan (don't use non-stick) briefly over medium heat. Add the oil. Use all the oil specified. It's important. When the oil starts to shimmer add the onions and green peppers and stir every few seconds. You want the green peppers to be skin side down as much as possible. Fry until the pepper starts to blister and the onion edges turn brown. Next comes the garlic ginger paste and the cilantro stems. Add them into the pan and cook it, stirring constantly, until the garlic ginger paste stops sputtering. Turn the heat up to medium high. Add the diluted tomato paste and stir until bubbles form (the oil will likely separate). This takes around 30 seconds to one minute depending on the heat. Add 3 oz of curry base. Stir until bubbles form (little craters really), around 30 seconds. Watch the edges of the pan. The curry can stick here. Add the rest of the curry base and let cook until the bubbles form. Turn the heat down to low and add the pre-cooked lamb, beef or chicken and the green chilies. Let the curry simmer for about 5 minutes. If it gets too thick add a bit more curry base. Don't add water. Add the cherry tomatoes and cook until they are heated through. Can I just come live in your kitchen??? Indian food is my favorite, hands down, but not my husband’s. I NEED my FIX. This chicken jalfrezi looks fantastic! And I love the blistered peppers clue for getting a smoky flavor. Bring on the heat! Haha. Thanks for that. Maybe you could try making one of the curry recipes and see if that does it for him? The blistered peppers thing was a bit of a revelation for me the first time I did it. Really makes a big difference. 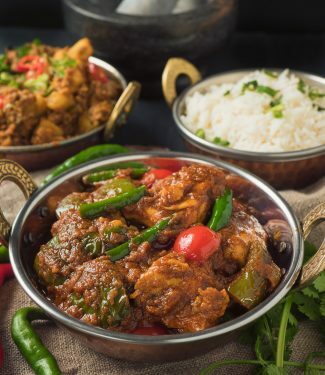 Hi rsaha found this recipie for jalfrezi the best I’ve ever tried and I’ve tried loads it’s just like the takeaway I get it from and tastes amazing another of my favourites is garlic chilli chicken do you have a recipie for this ! ! ! Glad you like it. I don’t yet have a recipe for garlic chili chicken but it is on the list. In the meantime there are lots of other restaurant curry recipes here for you to try! Riva – that’s one of the nicest things I think anyone has ever said about glebekitchen! I am so glad you are learning new things by visiting. 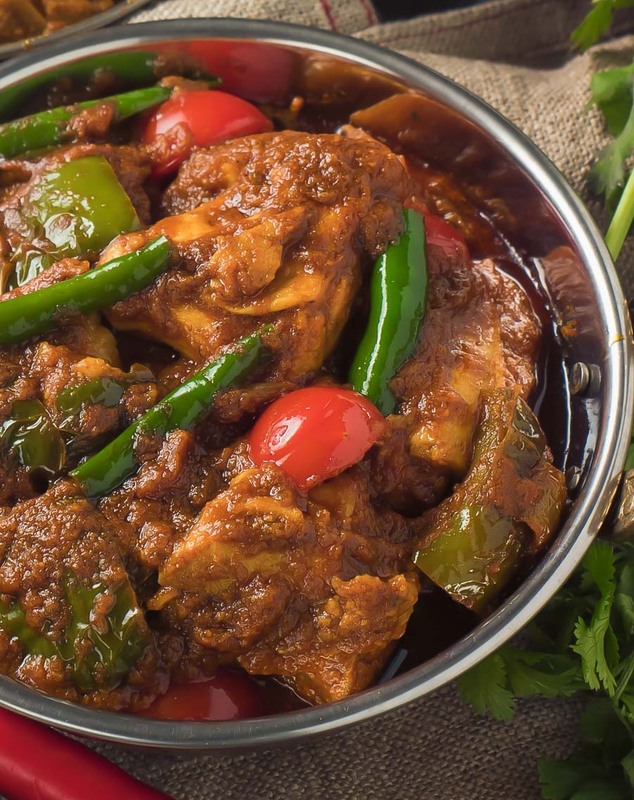 This chicken jalfrezi looks amazing! Such big flavours, especially with the smoky flavour created by blistering the peppers! Great tips on pre-cooking the meat too! Thanks Romain! The smoky flavours are what makes this dish special. It’s often the little things that add up to make something better than expected. Smokey flavor? Yes, please! This Indian curry sounds amazing, you are the curry king! Ha! If I ever get a food truck it’s going to be called The Curry King. Yay– more curry! You are DEFINITELY The Curry King (I approve of that food truck name!) This curry looks delicious. Love the flavors here. Hot green chilis have such an amazing heat and the spice mix you have here looks like it could go well in a lot of dishes. Can’t wait to make this soon! Alyssa, you can eat for free the first month The Curry King is open for business! This was amazing, tried so many curry recipes until i came across this site, bulk made the essentials a few week ago and froze sauce. Made today just as it said but with extra green chillis and a drizzle from a lemon to finish. So happy i dont need to ring a takeaway for good curry anymore. Please post a balti next! So glad you liked it. A few extra green chilies is a nice addition but not everyone likes it quite that hot so I try to post the recipes on the milder side and let people add what they like. I will start researching balti next – haven’t tried to make one yet. I tried this recipe for the 1st time and omg it blew me away. It tasted better the next day than it did when I made it but I genuinely think it tasted better than my local curry takeout. I will make this my go to recipe from now on and make it again and again. Thank you so much for this!! That’s great to hear. Now you have the technique down there are lots of other curries on glebekitchen that you can try – and more coming all the time. Wow. This is an authentic and very tasty curry. Pre prep of the curry gravy is essential. I made this a few weeks before, froze some batches , then defrosted before use. Read the recipe BEFORE starting the cook and prep all the ingredients in separate bowls. Spices in one. Serve with Basmati rice, chapatis, cold beer and friends. Steve White, an enthusiastic amateur cook. A good curry with friends. That’s good living! So glad you liked it. And yes, prep is key when you need to move fast in the kitchen. I love to cook a curry for friends on a weekend wherever possible. I have always wondered how the resteraunts and takeaways manage to get that distinctive taste and consistency, so when I stumbled across your site I was well pleased! I made the base last night and I’m planning on doing a bhuna or jalfrezi tonight, is it ok to double ingredients to make a larger batch for say 4 people or do I need to stick to 2 portion batches? It is better to cook two batches. The recipe doesn’t scale linearly and you want to be able to put lots of heat into cooking the curry base. I made a little video recently on the technique (here’s the link) you might want to watch before you try your first curry. Enjoy. It’s addictive. Thanks for your quick response and advice! I am now posting immediately after making both the bhuna and jalfrezi with a big smug grin on my face! I’ve been trying to cook like this for ages. The only deviations from your recipes was that I had to use ground fenugreek because I couldn’t get hold of any leaves but only used half tsp, and I couldn’t get any tarmarind sauce so just left it out. Wow amazing 😉 thank you very much I want to tell everyone but also want to keep this to myself 😀. Next time I will make sure I have tarmarind sauce and see if I can tell the difference. Paul – tell everyone! Great to hear you liked it. Tamarind sauce adds a little tang. You’ll know when you taste it. Truly 5 star 🌟 amazing recipes can’t wait to try them all!